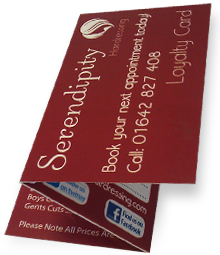 Pick up your loyalty card and collect your stamps to recieve a half price cut and finish. At Serendipity we can offer a fresh, modern alternative to 'wedding hair'. Call Caroline for a consulation; from there we'll put the hard work in so you can take the worry out. Our Awards Include: Ladies NHF 1st place in creative colour, cutting and north east bridal champion. Bridal practice four weeks prior to the Wedding Day. On the day, Bride and two Bridesmaids £150.00 in the salon. Bridal practice four weeks prior to the wedding for the Bride and one Bridesmaid. On the day, the Bride and four Bridesmaids £245.00 in the salon. Bridal practice four weeks prior to the wedding for the Bride, Mother of the Bride and one Bridesmaid. On the Wedding Day, the Bride, four Bridesmaids and Mother of the Bride £305.00 in the salon. We realise that the morning of the Wedding Day can be quite hectic. At Serendipity we can provide our wedding packaegs in the comfort of your own home or local wedding venues. Additional charge of £50 per stylist will incurr for this service. Cost of travel and extra service before 9am will be an additional cost. Contact Serendipity for further information. Please Note, all hair practices prior to the wedding are a maximum of one and a half hours. Payment for the practice and a £50 deposit to secure your date will be taken at the time of the practice session and will be deducted from the chosen package on final payment. Additional practices will be charged for. All packages in salon include a bottle of fizz. Winner of the North East Bridal NHF Awards. At Serenedipity our AWARD WINNING stylists offer three fabulous wedding hair packages for you to choose from. Follow us to receive our news and offers!